Smooth velvet skin, on which there is no a single hair, is the dream of every girl. Therefore, new alternative methods of fighting undesirable hair appear every day, among which sugaring is the most effective one. Due to the fact that the sugar paste deeply penetrates the follicles, the hairs are removed almost painlessly and for a long time. However, in addition to the painlessness and effectiveness of the procedure, the safety of the master and the client is very important. 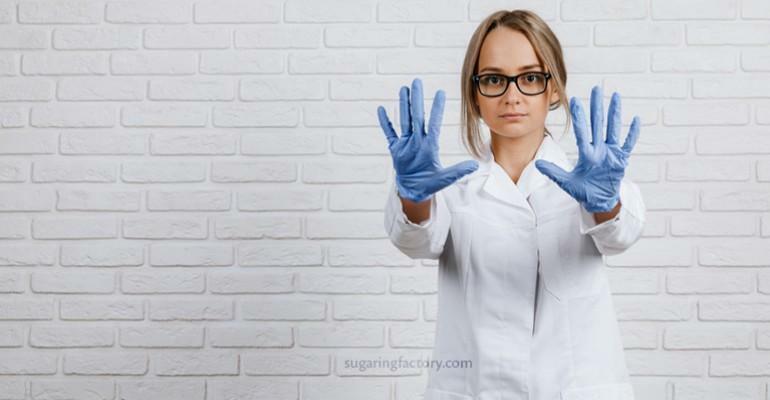 Gloves is an additional protective barrier, which prevents the pathogenic flora getting on the inflamed skin of the client and protects the hands of the practitioner during sugaring. Nitrile gloves are a worthy alternative to the usual latex. This material has similar functional characteristics, usablity and reasonable price. The main advantage of nitrile, which latex doesn't have - hypoallergenicity. The fact is that such body parts as, for example, the bikini zone are quite sensitive, so the contact of the practitioner's hands in latex gloves can provoke an allergic reaction. In combination with irritated after the epilation skin, sensitization can lead to the development of urticaria, itching, burning and swelling. Therefore, the use of nitrile is advisable when performing any procedures with the patient's skin. This can prevent the occurrence of undesirable consequences. The fact that nitrile gloves are absolutely hypoallergenic and cannot harm in any way the hands of practioner, client or patient is not the only advantage. Due to its unique properties and characteristics, this material is three times better than latex, because it is more resistant to punctures. This is extremely important, because sudden movements during epilation can damage the integrity of the glove, and its replacement will lead to a hardening of the sugar paste in meanwhile and elongation of the procedure. Until recently, the use of nitrile gloves was associated with huge discomfort, because they were loosely adhering to hands, which undoubtedly affected the quality of the work performed. But over time, manufacturers changed the structure of the material, greatly improving the comfort of wearing such gloves. Due to those changes, there are no visible differences between natural rubber and nitrile anymore.